Tips and tricks on how to measure room before using Floor Styler. Welcome to our first Floor Styler blog. Here, we will be discussing some very basic concepts of interior design and planning. An active participation from our readers is always heart-warmly welcome. Good interior design not only makes a space look better but it also has a significant impact on the mood and the wellbeing of the inhabitants. Job of an interior designer is to use color, patterns, lights and textures imaginatively and efficiently to ensure productivity and functionality of a particular space as well as to make it beautiful to look at. Before starting any sort of planning and designing works, designer or planner must have measurement the space to be developed. Without proper measurement of the floor no design and planning are possible. There are a few ways for measurement. The easiest among them is using a measurement tape. It is available in almost every store at a very low cost. Another way of measuring dimension is using the laser measuring device. These devices, if used correctly, can provide very accurate readings. These devices emit a laser beam and the distance between the device and the surface where the beam strikes is displayed on the device screen. 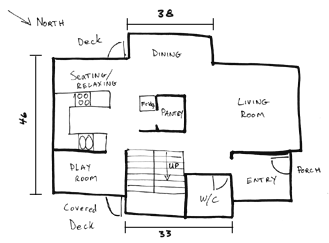 First step for measuring a room is to draw a rough sketch of the room on a piece of paper. Then measure the floor and put dimensions into the drawing. Aspect ratio is not important but it is important to mention the door and the window position of the room as well as the direction on rough sketch to help the architect in designing the interior of the room. A room can be of various shapes like rectangular shape, irregular shape or round shape. If your room is of rectangular shape, then simply measure the length and breadth of the room and multiply both to obtain the entire floor area. For round shaped room measure the longest width and breadth from wall to wall then multiply both and multiply with pi (a constant with value of 3.14159) and divide by 4. Then you will get the total area. For a room with irregular shape, divide the entire area into smaller areas such as each smaller area represents a rectangle or a square or a triangle etc. 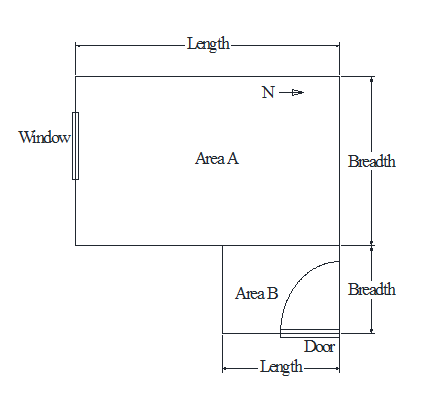 In a ‘L’ shaped room the total area is divided into two rectangles as A and B as in the figure below and the length and breadth of each rectangle are measured to obtain the entire floor area. And, that’s all for today. Don’t forget come here again to know great and exciting stuffs!